and includes Armchair Theatre, Tales Of The Unexpected and Woof! The insistence of the American co-producers to have the title theme provided by Elmer Bernstein is an added bonus, and is commercially available for the first time with this release. The composing legend (The Magnificent Seven, The Great Escape, True Grit) delivered a stirring call to arms, a real collector's item. Performed by Paul Lewis and The Belgian Studio Symphony Orchestra. 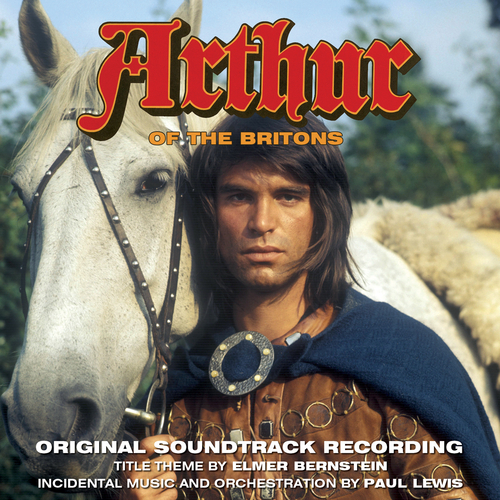 Arthur Of The Britons is an unreleased HTV score from the early 70s, and opens with a chiming, adventurous theme by PAUL LEWIS, who follows that with a further 32 cues he wrote for this good-looking historical drama starring Oliver Tobias. With the use of muted trumptes, excellent and consistent pizzicato percussion and woodwind he creates an interesting, distinctive but not too obvious period feel. Many of the cues are a good length: mini “mood” suites, if you like, created as music that could easily be edited, chopped and used when needed. It’s simple but quite deep, with some unexpected arrangements, and it teeters on the brink of mystery, horror and suspense – genres that Lewis seemed to specialise in. Interesting and unexpected, it also finishes with the original Elemer Bernstein theme, which actually seems wildly out of place and far too American for our Arthur. The Belgian Studio Symphony Orchestra - To Battle! The Belgian Studio Symphony Orchestra - Chase!